Coming off the successful launch of the affordable Blaze Glory 918N dual-SIM Android phone, Alcatel held an event recently to launch two new devices to join their growing line of Google-powered mobiles. The former is a slightly updated version of the popular Blaze Glory with interchangeable color covers, and the latter is a new flagship large screen, high power processor device – respectively called the Glory X 918N and the Sapphire HD 995. These new devices continue the Alcatel promise of great features for very affordable prices. In fact, the Glory X is only PHP 6,199 – PHP 200 more than the Blaze Glory – and comes with all the features plus an additional color cover in the box. The Sapphire HD on the other hand, has a 1.4Ghz processor powering the device with a large 4.3” 800×480 screen for only PHP 13,999. Both devices are definitely quite affordable for the specs they’re delivering. The Alcatel Sapphire HD 995 (pictured above) is the aforementioned new flagship device in their new lineup – probably a first for the French mobile-phone maker here in the Philippines. It packs a powerful single-core 1.4Ghz processor, 4.3” 800×480 screen, 5MP camera with LED flash, VGA front facing camera, 720x30p video recording, and all the usual Android connectivity options. Aside from the usual custom Alcatel skin on the Android 2.3 OS, it has 3D homescreens that you can toggle which works smoothly and creates a much more interesting UI. With such a large screen and capable processor, this can effectively compete with popular 1Ghz+ Android devices, but with a much more affordable price tag at only PHP 13,999. At the same time it also promises to be sleek, thin, and light enough so that it won’t make a dent in most pockets – literally and figuratively. The next unit is the extremely affordable dual-SIM Glory X 918N. At only PHP 6,199 its about the same price as its predecessor the Blaze Glory 918N. Internally they’re almost the same phone – both packing a 650Mhz processor, 3.2” 320×480 screen, 3.2MP Camera, and its famous Dual-SIM/Standby capabilities. The new Glory X though has a new personalization feature in the form of interchangeable color covers. For the package price, you get an additional cover in the box – effectively only costing another PHP 200 for an extra color to your phone. The original 918N was a huge competitor to the Galaxy Y (and a much better choice in our opinion) which should make the new Glory X 918N another great alternative to the low resolution Samsung budget droid. Whichever the case, both versions of the 918N are pretty affordable and should be one of the first few choices for Android consumers in a budget. Both phones should be available now at Alcatel stores nationwide. So whether you’re looking for a new color-changeable budget Dual-SIM Android device, or an affordable powerhouse droid, drop by an Alcatel shop near you to check out the Glory X and the Sapphire HD – they might just be the Droids you’re looking for. To see more of the Sapphire HD 995 and the Glory X 918N in action, check out our preview video below. To see more pictures of the event, check out our gallery below. Sir Alex, can’t see clearly, about the Sapphire HD 995, does it support Video calling (ie. 3G, Skype)? Skype supports most phones that have a FF camera running Gingerbread now so I’d say the 995 should be able to do video calling with Skype fine. Will try to get a 100% sure answer for you though. i bought this last week monday, it’s a fantastic fone for it’s price & specs. 1.4ghz single core/ 512 (386mb -usable) ram / dual camera / hdmi out / led flash / promised Ice Cream sandwich OS upgrade. btw, the user interface is just cool however i find the installed launcher (shell spb) takes up too much memory and therefore battery so i switched to the stock launcher. however, i noticed that battery life isn’t that good as it rarely last 12 hours of regular use. last sunday i sent it the service center & recommended it to be replaced & immediately returned it to the retailer the same afternoon. i hope it’s just an isolated case of a defective battery / charger / unit. well, the store i bought it from, just sent me a message last night that my replacement unit is ready for pick-up. i’ll make another post to see how the replacement unit does. hi apple try installing apps called easy battery saver and easy task killer, it made some improvements with my battery life. btw another tip, if you find the stock music player poor, please try out x play as a replacement mp3 player, the sound will be deeper and richer. Did they replace your battery yet sir Bong? Or does the 995 really only last 12 hours? On average we get 14-16 hours from most phones. Does the g918n works on 3G network both sim? I want to buy this and use in japan. Only UQ Communications 4G WiMax and NTT DoCoMo use the GSM standard in Japan. Most operators use CDMA which isn’t compatible with any GSM phone like this one. Basically international phones won’t work in Japan for the most part. Hope that helps! Does the alcatel ot 995 support video calling,picture and video uploading and video streaming? Any Android is able to upload pictures and videos as well as stream video from YouTube or other sites. However, for video calling it has to be tested especially for Skype since some phones, even with front cameras, won’t work on it. We’d guess it does work, but to be absolutely sure we have to test it out for ourselves. Hope that helps! Can i work as an economist at alcatel? And how much would i be paid? Does the alcatel OT 995 have an opera mini-4 browser? 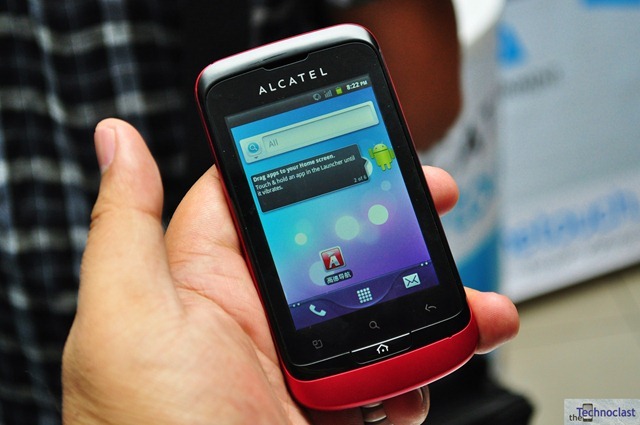 Last we checked, the Alcatel 995 has a slightly-customized browser based on Android’s stock Webkit browser. But you can install a lot of other browsers, including Opera Mini, if you like. We don’t know. We don’t work for Alcatel. Maybe you should contact their HR department. Hope that helps! But is the browser fast? Pretty much all Android phones with 1Ghz+ processors can handle the Android Webkit browser really well, so yes. Its fast enough. Hope that helps! how to put off the camera sounds of my alcatel glory x? 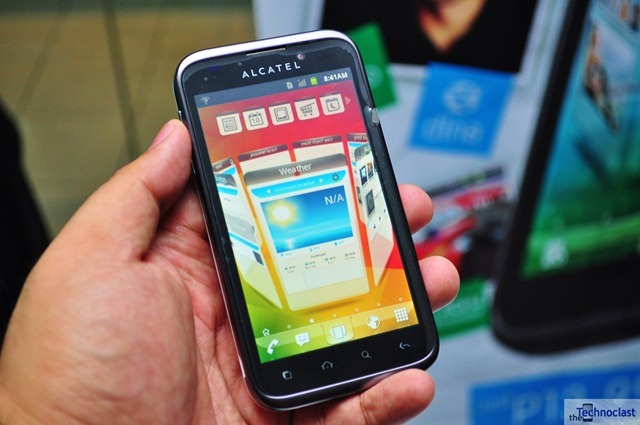 Do you think the Alcatel 995 can be upgraded to Ice Cream sandwich OS? my alcatel glory X 918n turns off and turns back by itself..is this normal for alcatel? or my phone is having a problem?